Throughout my life I’ve played lots of music, although not continuously. I’ve played in project bands, in jam sessions, and in orchestras. Playing music on a serious level takes lots of time, so for the moment I tempered my musical activities to have more time for my other activities. Me playing timpani at Pieter Aafjes, conducted by Arjan Gaasbeek. I’ve been timpanist for Koninklijke Harmonie Pieter Aafjes (Culemborg, Netherlands) and Harmonievereniging Kunst Na Arbeid (Ingen, Netherlands), both conducted by the talented director Arjan Gaasbeek. Besides timpani I play most percussion instruments, both pitched and unpitched. I learned timpani, drums and some percussion by Peter Wilms from 2009 to 2011. I’m a well-known replacement musician at different orchestras (both philharmonic and symphonic) in my neighbourhood. I also perform regular maintenance (replacing heads, tuning, small repairs, etc.) and provide timpani crash courses for amateur percussionists who are asked to play timpani at their orchestra but never learned how to play them. Being a timpanist means that you have a nice overview at the orchestra. You witness almost everything that happens: mistakes, balance problems, funny situations, etc… Eyeball communication with the conductor is key, because many musicians simply follow the timpanist or drummer while playing (instead of following the conductor). I owned two old Ludwig timps: a 26 and a 29 inch, Professional Series. Their kettles were made of fibre. I replaced the heads, did some small repairs and a lot of cleaning and tuning to get them playable again. I used them for exercising and for a few gigs. In 2016 I sold them to a local band to replace their ancient “flower pots”. Playing with KNA Ingen, at the Hanzefestival in Zwolle. In the summer of 2010 Pieter Aafjes bought a brand new set of timpani (23, 26, 29 and 32 inch), Professional Generation II, manufactured by Adams. These are really great timp’s to use for band music. The balanced mechanism works great, clearing the head was never that easy before. I also put some focus on mallet percussion for a while. 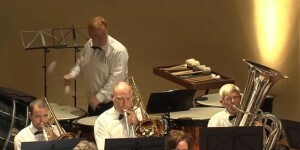 Instruments like marimba, xylophone and vibraphone are great to play, although the playing techniques are really different. I have a slight preference for vibraphone, I absolutely love its sound, from tranquille melodies to beautiful jazz chords. Besides timpani and mallet percussion, I also like to play small percussion. Creating the optimal effect could be a great challenge, even if it’s by just using a “simple” triangle. Drums is a very nice way to exercise all kinds of rhythms and patterns. I started snare drum lessons in April 2009. Therefore I needed a snare drum for practising. Instead of buying a snare drum, I decided to buy a complete drum set. I play a couple of guitar chords to sing along, and also took bass guitar lessons for a year. I still play bass guitar now and then, when playing music with friends or just playing along with some popular songs. I absolutely love to play blues music on bass guitar! The list down here shows some of the works I played the last years. The list is far from complete, but illustrates my musical capabilities. Of course, in most cases I played the timps.